Edgar and Sabin are brothers, and the sons of the previous king of Figaro. They both have quite differently personalities and while their father wanted both of them to share the ruling of Figaro, only Edgar would. They have possibly the least tragic story and a lot less interesting than the others, but Edgar’s flirtatious nature and Sabin’s serious martial-art focus makes the game quite a bit more interesting. Their drive to hate the Empire comes from their father being poisoned during his time on the throne. In fact this and a few other reasons drove Sabin to want to leave their kingdom with Edgar as well. 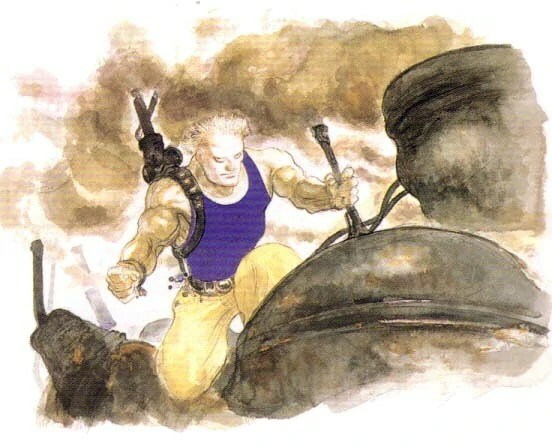 Edgar could not stand seeing their kingdom fall as they ran away, so he used his rigged coin his father gave him to get Sabin to go free while he ruled the kingdom. 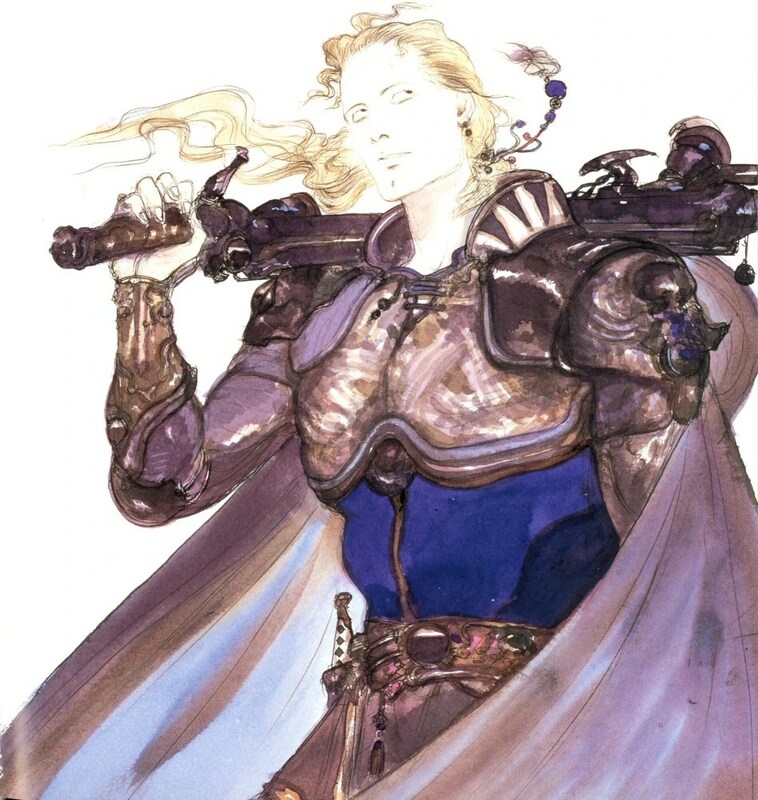 Once again the title pictures are Edgar and Sabin in their Amano artwork (Edgar on top) and right above is Edgar and Sabin’s sprites (Edgar to the left). I don’t have much to say about them besides the fact that Sabin’s strength and martial arts training is almost comically noticeable. While their story is probably one of the shortest and theirs not an extreme amount depth to these characters as some of the others I find their theme very interesting. This is mostly because Nobuo decided to put their theme’s into one song. This secures the fact that these two are brothers, and close brothers at that. However, I believe that two separate themes can be heard in this piece. A trumpet holds the very royal/heroic melody from the start of the piece, and a bit of the way through there is a section that is a pretty drastic instrumentation change. It goes from being the trumpet heavy beginning to very string heavy. To me, this shows two separate themes in one song: Edgar’s in the beginning and Sabin’s as the second section. The trumpet, other brass, and percussion really put out the royal nature that is Edgar’s number one focus, while the strings show the freedom that Sabin always wants. What’s even cooler about putting these themes together is it shows that these brothers have a slight longing for what the other has, and both of them have the Royal kingliness and freedom of a martial-arts master in them.